Muscle can be categorized into three types based on structure, function, and location in the body. The specific details of muscle, including structure, physiology of contraction, energy requirements, muscle conditioning, and disease, can be illustrated using skeletal muscle. The three types of muscle are skeletal, cardiac, and smooth muscle. Skeletal muscle is attached to the skeleton and moves the body and its components. It appears striated (striped) under the microscope and is under voluntary control. The biceps of the arm is an example of skeletal muscle. Cardiac muscle is only located in the heart. Cardiac muscle is also striated, but is not normally under voluntary control. Smooth muscle surrounds blood vessels and other passageways and alters the size of openings or passageways and propels material through body tubes. Smooth muscle is distributed throughout the body. It lacks striations and is involuntary. The respiratory and digestive tracts have layers of smooth muscle in their walls. A skeletal muscle fiber is formed from the fusion of many embryonic cells during development to form slender cells that extend from one end of the muscle to the other. Each muscle fiber normally has one nerve fiber that extends to the cell membrane, forming the neuromuscular junction. There is a 100-nanometer space, the synaptic cleft, between the nerve fiber and the muscle fiber. The muscle cell membrane forms inward projections, the transverse tubules, associated with the cell's smooth endoplasmic reticulum (here called sarcoplasmic reticulum). The sarcoplasmic reticulum stores calcium and surrounds bundles of contractile proteins . The contractile proteins, which do the work of contraction, are parallel and arranged in an overlapping pattern that gives rise to the muscle striations. The pattern of striations is repeated many times down the length of the muscle fiber in segments called sarcomeres. The proteins of the sarcomere are grouped in thick filaments and thin filaments. Contraction occurs when thick and thin filaments slide past each other, pulling the muscle ends closer together. A thick filament is a bundle of approximately two hundred myosin proteins. A portion of each myosin protein projects outward to form myosin heads. Microstructure of a muscle cell showing the close association of the sarcoplasmic reticulum and the myofibrils. Thin filaments overlap the thick filaments and are composed of three types of protein molecules. The main protein is actin. Three hundred to four hundred molecules of globular actin (G actin) link like beads in a necklace to form a strand called fibrous actin (F actin). Two such "necklaces" are then intertwined into a loose double helix. In the groove between the two F actins, much like a string, is the protein tropomysin. Each G actin contains an active site to bind the myosin head. When the muscle is at rest, tropomysin covers the active sites of actin. Attached to tropomysin is troponin, a small complex of three polypeptides . This structural arrangement allows muscle to contract. Muscle contraction begins when the nerve fiber releases the neurotransmitter acetylcholine into the synaptic cleft. Acetylcholine moves across the synaptic cleft and binds to receptors on the muscle fiber. This indirectly initiates an action potential , a change of electrical charge at the membrane that is similar to events in a neuron . The action potential spreads across and into the muscle fiber via the transverse tubules and triggers the release of calcium from the sarcoplasmic reticulum. Next, calcium binds to troponin, causing the troponin to change shape. Since troponin is attached to tropomysin, as troponin changes shape the tropomysin is pulled away from the active sites of actin, which become exposed. The myosin head, which was previously blocked by tropomysin, now binds to the active site of actin, forming a cross-bridge between the thick and thin filament. In a ratchetlike movement, myosin pulls the thin filament past the myosin as the myosin head repeatedly flexes, lets go of the actin, extends and attaches to a new active site, and flexes again. As the many myosin heads continue to repeat this process, thin filaments slide past the thick filaments and the sarcomere is shortened. Shortening of all sarcomeres within the muscle fiber results in contraction of the whole fiber. Muscle relaxes and returns to its original form when tropomysin covers up the active sites of actin, preventing the formation of cross-bridges. Relaxation also involves the destruction of acetylcholine by acetylcholinesterase in the synaptic cleft, ending muscle stimulation, and the re-uptake of calcium into the sarcoplasmic reticulum. Without calcium, troponin returns to its original shape, pulling tropomysin back over the active sites of actin. Myosin no longer forms cross-bridges, so the muscle relaxes. 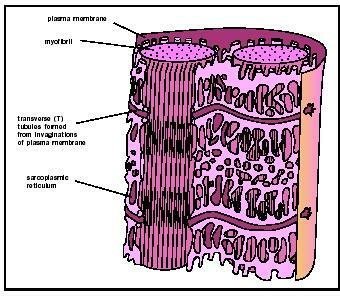 Depolarization of the T-tubule membrane causes a release of calcium ions from the sarcoplasmic reticulum, triggering muscle contraction. Myosin heads in a myosin thick filament cluster to the outside, with the tails lining up inside. The heads on either end point in opposite directions. During muscle contraction, the heads pull actin filaments together toward the center bare zone, contracting the muscle fiber. Note that a muscle can actively contract but cannot actively extend itself. For the releasing, muscles are usually present in pairs, each working against each other. The contraction of muscle fibers requires a large amount of energy in the form of adenosine triphosphate (ATP). ATP is made available through various mechanisms. A limited amount of ATP is stored in the muscle cell. ATP is also produced by a phosphate transfer from creatine phosphate to ADP ; muscles do store larger amounts of creatine phosphate. The stored ATP and the ATP created from creatine phosphate are available for immediate use and provide approximately enough ATP for about six seconds of exercise. Additional ATP can be produced through anaerobic and aerobic metabolism . Aerobic respiration provides a larger production of ATP but depends on sufficient oxygen delivery. Myoglobin, a protein in muscle cells that binds oxygen, contributes some of the oxygen for aerobic respiration. Aerobic ATP production also requires mitochondria . Muscles packed with mitochondria give meat a darker color ("dark meat") than muscles with fewer mitochondria ("white meat"). Anaerobic fermentation provides less energy but can produce ATP in the absence of oxygen. A serious drawback of anaerobic fermentation is the production of lactic acid, a product that can alter cell pH . Both processes can use glucose released from glycogen, which is stored in muscles as a reserve fuel. A decrease in the ability of muscle to contract is muscle fatigue. Muscle fatigue can result from short burst of maximum effort, such as a 50-meter swim, or sustained long-term activities such as marathon running. The cause of fatigue depends on the activity. Fatigue from short, extensive burst of activity can result from depletion of ATP or buildup of lactic acid. Muscle fatigue from sustained activities can result from depletion of fuel molecules or depletion of acetylcholine at the neuromuscular junction. Through training, a muscle can become larger (hypertrophy) and have greater endurance. A muscle grows mainly by increasing the number of thin and thick filaments within the fibers. Growth results from repeated contractions of muscle, as in weight lifting. Muscle conditioning is the increased ability of the muscle to perform a task, either because of greater strength or better fatigue-resistance. Many changes in muscle performance, however, result from changes in the cardiovascular and respiratory systems, enabling them to deliver fuel and oxygen to muscle fibers more efficiently. Many changes specific to muscle fibers involve enhancing energy production, including an increase in number of mitochondria and myoglobin and greater storage of glycogen. Diseases affecting muscle can result from loss of neurons that stimulate the muscle, such as polio; changes in the neuromuscular junction that result in loss of ability to stimulate the muscle, such as myasthenia gravis (an autoimmune disease ); or loss of structural integrity of the muscle fiber, such as muscular dystrophy. All result in decreased ability of the muscle to contract and sometimes the complete loss of the muscle's function. Andersen, Jesper L. "Muscle, Genes and Athletic Performance." Scientific American 283, no. 3 (2000): 48–55. Bevan, James, and Richard Bayliss. A Pictorial Handbook of Anatomy and Physiology. Barnes and Noble Publishers, 1996. LeVay, David. Teach Yourself Human Anatomy and Physiology. NTC Publishing Group, 1993. Van Baak, Marleen A. "Relationships with Physical Activity." Nutrition Reviews 58, no.3 (2000): 52–53. Arthritis is a breakdown of articular hyaline cartilage, often increased by enzymes of inflammation. Rheumatoid arthritis is an autoimmune disease, in which one's own immune system attacks healthy tissue. Osteoarthritis may be caused or accelerated by obesity, joint injuries, defective cartilage, lack of exercise, or biomechanical defects. Defects of only 1 square centimeter will alter the functioning of the articular cartilage. Osteoarthritis is a major cause of joint replacements. A process to harvest and grow articular cartilage outside the body, called autologous chondrocyte implantation, is under investigation as of 2001. It is expensive and not exactly like real cartilage. However, in the future, replacement may employ stimulating growth factors, cartilage cells taken from an accessible place in the patient's body, and a synthetic matrix (scaffolding).